Knowing a Gemini is like having a never ending supply of Cracker Jack because there’s a surprise in every moment! Seekers of knowledge, on of Gemini’s major personality traits is that they tend to flit from one subject, job and relationship to the next. Never delving very deeply into anything it’s easy to see why this Zodiac Sign has a reputation for being shallow. But I say Gemini’s view life as one big party and they its perfect host! Ever the social butterfly, Geminis move about the Universe graciously greeting each person, place and thing before moving on to the next “guest”. As long as the rest of us do not expect a Gemini to stay very long or get heavily involved in anything or in any way, it’s hard not to fall in love with the entertaining Twins. 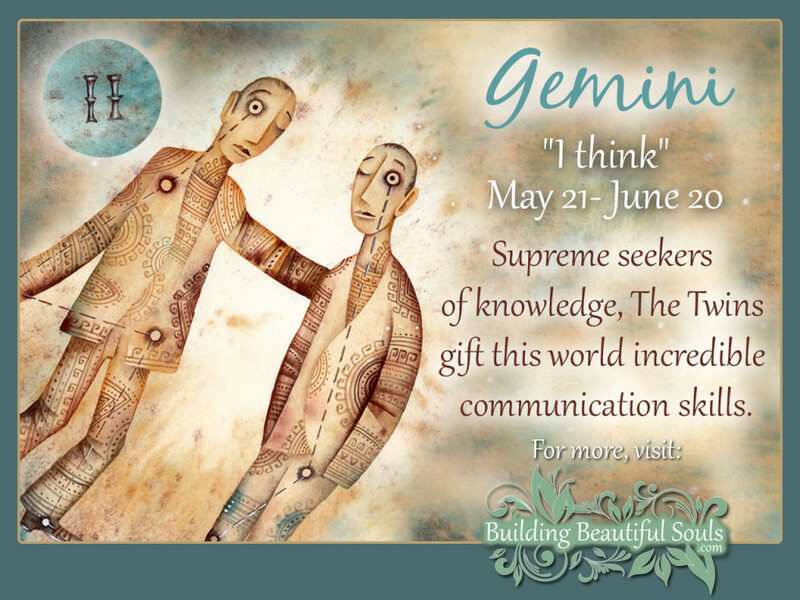 Flexible, resourceful and well-spoken the Gemini Sign is all this times two! However, a Gemini characteristic that is not quite as flattering is that this Star Sign can turn resourceful to user, flexible to unreliable and well-spoken to opinionated in a matter of seconds. The duality of The Twins is nigh until infamous. What they do and say on one day can (and often does) change the next. It is very hard for most people to keep up with which Twin is in the limelight at any given moment. The saving grace here is that Gemini has both charm and wit that often gets them out of trouble. Having a ruling planet of Mercury certainly explains a lot of this – they’re constantly on the move, ever restless and a Gemini’s thoughts race like a well-tuned engine. The Element of Air also plays a key role because it constantly alters directions. A savvy Gemini knows how to use this elemental energy to re-approach difficult situations from a whole new tact. That can help greatly in problem solving and it also avoids boredom that The Twins suffer from if left sitting still too long. It’s also very useful in social situations where the Gemini personality shines brightly. Gemini’s tends to be fairly average in height with slim frames and long legs. Their facial structure is well defined and highly expressive. Their adaptability makes it easy for The Twins to fit into a wide array of situations with little trouble or discomfort. The intense energy of the Twins may lead to sleep disorders and difficulty turning off random thoughts. A physical trait of Gemini to watch out for is that arms and hands tend to be the most susceptible to injury. Greek mythology tells of Queen Leda receiving a visit from none other than Zeus himself. She was also married to Tyndareus, who bore the image of Cygnus the swan. Both men were apparently randy and fertile, and the Queen bore four children, two immortal named Helen and Polydeces, and two mortal named Clytemnestra and Castor. Caster and Polydeuces were forever going off on adventures together until Castor was murdered by a jealous man. Polydeuces did not wish to be separated from Castor so the two spent one half the year on Olympus and the other in the land of the dead. Ptolemy, an astronomer, had a different view of the twins, feeling the key stars represented Apollo and Heracles. In love, the Gemini sign isn’t always terribly lucky, being prone to separation. That makes it all the more important to find the right partner. Astrologically Libra is probably best for compatibility. They have a level head that pulls The Twins together and keeps them centered. Aquarius has a whimsical nature that attracts Gemini and keeps them engaged. Finally Leo can work, but the Gemini personality may find The Kitty a little too strong headed. Want to know more? Read the full Gemini compatibility profile. Mom and dad will have their hands full with the clever but exasperatingly changeable Twins. The Gemini child is marked by insatiable curiosity. From the moment they can talk prepare yourself for 101 questions. If you don’t know the answer, try directing all that energy into books or online searches where his inquisitiveness can wander at will. This nature also leads The Twins toward dabbling in and often switching from one hobby to the next, typically with a dramatic flair. Many Gemini children have an attraction to that natural world. They will want to explore it with all their senses. Be on the lookout because they also meander off without much thought. In choosing hobbies you may wish to steer The Twins away from something that requires a hefty investment as you’ll probably have to sell it in a few weeks when interests change again. One hobby that feeds the Gemini soul is the theater. Let them create plays in the back yard so they can keep changing the story to suit their whims. Precocious and sometimes manipulative, parents will have a challenge keeping the Gemini child on the straight and narrow. However, once directed in the right way, they can become very successful socially, particularly in communication fields. HINT: Punctuality is not in the Gemini’s vocabulary. Want to know more? Read the full Gemini Child astrological profile. Be ready to be on the go! A Gemini girl is not the patient type. She’s smart as a whip, but the dramatic two-sided nature of her personality can be frustrating. It’s not easy to keep these children engaged with just one thing. Gemini children love books – the more imaginative and colorful the better. Your child will always be hungry for that next bit of data. Be careful, however, as they quickly learn how to use that knowledge to pull pranks and all manner of tomfoolery. Want to know more? Read the full Gemini Girl personality profile. Dexterous and adventurous, a Gemini boy is a bit like the Chameleon of Astrology. He can change on a dime, and you’re left trying to keep up. These are not the type of children content to sit patiently in their chair with a stuffed animal. Rather, they will want to disassemble the critter to figure out how it works. When that proves tedious they move on to yet another great escapade, preferably one that brings laughter and smiles. Want to know more? Read the full Gemini Boy personality profile. Race care driver? High wire act? Cutting edge technology sales? Comedian? Gemini can do all this and more when they put their mind to it. After all, Gemini’s are networkers extraordinaire and will have many friends who will help them get the jobs they want. It’s not surprising to discover there really is no such thing as ‘a’ Gemini career. The Twins will likely hold many jobs throughout their life, each different than the last. That being said, Gemini’s would do well to be very careful with their finances as there might be constant fluctuation with earnings. If a Gemini seeks out animal companionship they’re likely to have two, one that appeals to each Twin. A cat and dog is one example. A perfect Gemini pet would be an intellectual creatures that can be trained to communicate such as parrots. Gemini enjoys a challenge but they’re not good at sitting still for very long. With that in mind, some good Gemini hobbies would include sports like tennis, handball and fencing. Gemini personalities aren’t shy about discussing things they like or are considering (they’ll always have a wish list). At the top of that list anything like a cell phone or PDA that keeps them in touch with others always ranks highly. Books, diaries, cameras and travel-oriented presents are also very welcome.